Quy Nhon (Vietnam) – December 12, 2018 (travelindex.com) – Minor Hotels announced the opening of Anantara Quy Nhon Villas, Vietnam. The property offers an upscale beachfront hideaway comprising 26 private pool villas inspired by the indigenous beauty of the Vietnamese coastline. 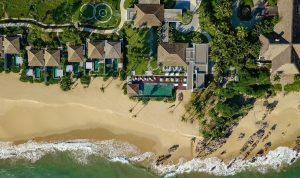 Located in a secluded bay amidst 7.2 hectares of landscaped tropical gardens, the resort boasts a secluded Anantara spa, Sea.Fire.Salt beachside restaurant and dedicated host services. Book your hotel in Vietnam and around the world in 55 countries at best rates available. Earn HolidayClick Points and pay at the hotel. Book now at HotelWorlds.com! – Local experiences include carefully researched itineraries and tours conducted by Anantara Quy Nhon guides. Quy Nhon is one of the last untouched areas of Vietnam with vast green rice paddies, long stretches of picturesque beaches and ancient Cham era (11th – 13th Century) temples dotting the country side. The beauty of the destination speaks for itself and as yet remains relatively undiscovered by international tourists (for now). Book your Anantara hotel in Quy Nhon and around the world in 55 countries at best rates available. Earn HolidayClick Points and pay at the hotel. Book now at HotelWorlds.com!